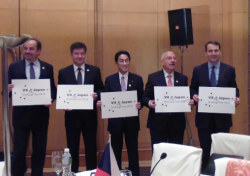 Foreign Ministers of the Visegrad Group and Japan met for discussion on November 11, 2013, on the margins of the ASEM FMM. The Ministers reviewed the current issues of cooperation between the two regions, with special focus on the V4+Japan Exchange Year in 2014, which will provide a framework for a number of joint events. They also discussed the relations between Japan and the EU and some international issues of common interest, among them the possibilities of cooperation in the field of science and technology, energy security, climate change and actualities of the Eastern Partnership and Western Balkans regions. Japanese Minister Kishida informed his partners about the security challenges of East Asia. 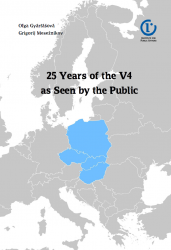 The meeting included a press conference, where Ministers presented the logo of the V4+Japan Exchange Year that was designed by a Hungarian artist, and stated that the all the five countries nominated Goodwill Ambassadors, well known persons of the cultural and scientific fields, to promote the program.